Wondering if anyone has seen Harbor Freights new monthly flyer. First time iv'e seen them offer a "Tactical Stream Light Pro Trac"
Just mentioning it as its not their usual cheapie 9LED free coupon ones.. I haven't seen that ad yet, but looking at there site, the only one I see is a "Quantum" brand that takes 4 AAA's; it looks like it's one of those zoomable variable focus types. 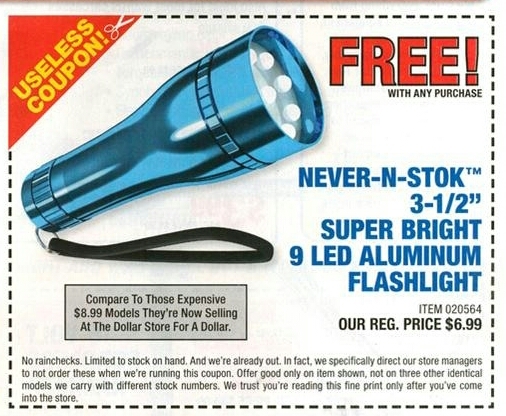 The flyer came today..and thats the one on the site..
Is there any difference than those Atomic Beam one's we see on TV? The 4 AAA's and somewhat thicker handle just got me thinking. Wondering if it's worth it on my next free coupon product run? I go by a HF on my way to AixiZ Laser--lots of visits are needed to take full advantage of the 20% off, the free item, etc. they give the discount to the cheapest item in your 'cart' so I 'hit' them going both ways. MIne lately. has had mixed 'boxes' marked 1$.2$ 3$ and 4$-(up front near windows)- the items change a lot and some really good deals there. tiny C -clamps for $2-- Most items in those boxes are marked down 50%. BUT.. they wont allow the 20% flyer coupon to be used on these. A few years ago I remember they let you use a bunch of free coupon's or the cashiers didn't care at the time. Same place in my store near the front for discounted opened boxed products too. The plastic and metal clamps are a great and "always" come in handy..
Yup, when you need a good tool from there always go for the pro series they carry and you will be ok.
Iv'e notice though the DMM free coupons aren't showing up lately or very much at all?? 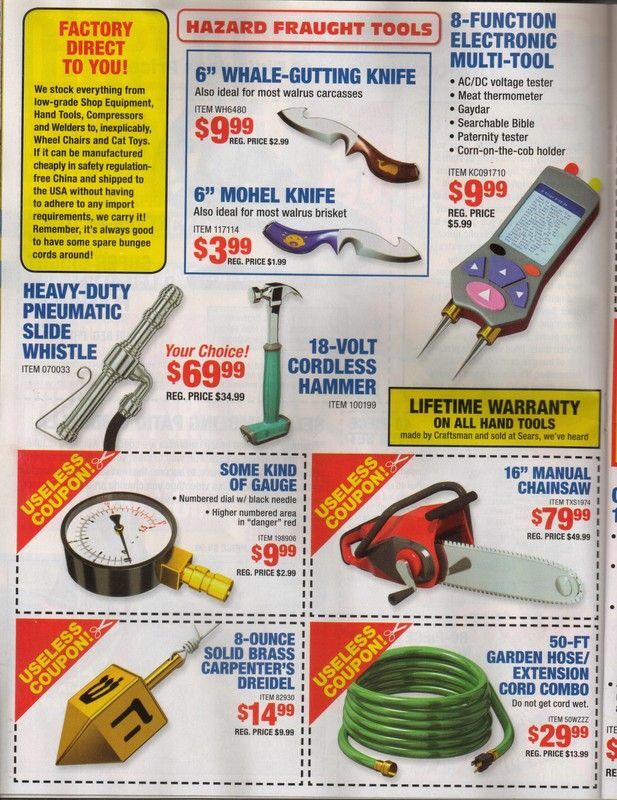 I've got to get back to a HF and take a look around, it's been a few years since I've visited Harbor Freight. I agree, Len you can get a good deal on some things there, but you have to know what's good, and what's, 'how shall we say it', ....not so good! The ones I shop at are on top of things--no way to get doubled up and forever I note that NONE of the flyers/coupons etc that I get by mail are EVER available at the store ---only the in-store flyers etc. .. so I keep those in my car. I have been able to get the one night guy to allow me to buy over the limit. Some coupons are only good for one per visit , while other coupons allow as many a 5.... and I did not need more than one coupon. Must be location and a very busy store as just once or twice the one I go to was out of the flyers free product's and a rain check for a regular sale item once.. They seen to be lots in the box under the checkout register or on the racks in front. There are so many flyers posted on the store front of up coming flee market type days where I think they bring out goods under tents on the weekends?? I think and in the all the years iv'e been going iv'e either missed it or i'm wrong. I will say to there are to many flyer's and coupons and many of the same items are shown double or triple with different prices and you can end up paying a few $$ more for the same thing.. "I'm confused as I type this"
Glad you liked it, Paul, here's a few more "Hazard Frought" funny ad spoofs to have a good laugh at. I literally laughed out loud at that:crackup:. It's funny because it is so true for HF though.